Wake up at 6AM. Peer outside the hotel window. Rain. WTF? Why does this line sum up every single motorcycle trip we've ever taken? Pinky is preparing the bikes for the Puja. Hotel security were looking on with great interest, I think they wanted to participate! We've got to pack the bikes before Pinky arrives this morning. We've got all our clothing, sleeping bag and other amenities (read electronix) in dry bags that we're stuffing into the metal sidecases and bungy-netting on the back of the bike. Thankfully the bikes are stored in an underground garage! With separate keys for each padlock on each sidecase, keys for the chain, and spare keys for each bike, there are no less than 8 keys per bike to have to fumble around for! Pinky arrives and meets us in the parking garage. He's brought some incense, flowers and candy. 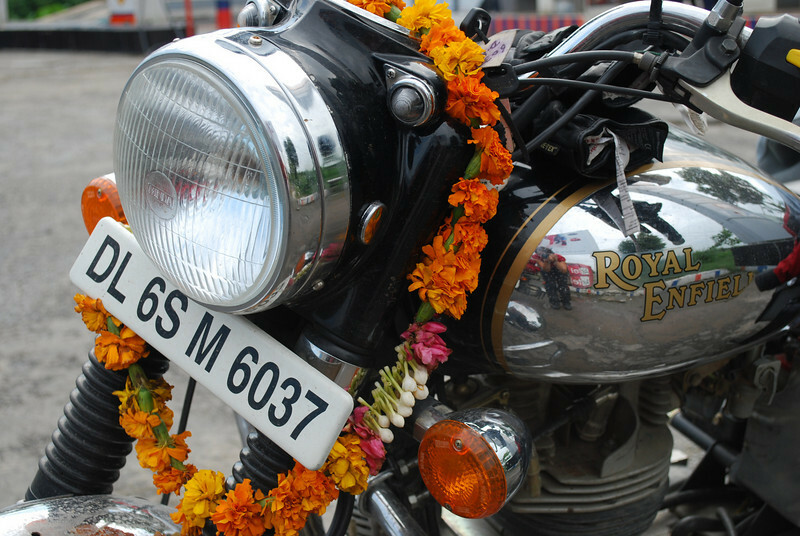 He decorates the front of both bikes with a garland of flowers, places incense sticks on the controls of the bikes and a bit of candy on the speedometer. 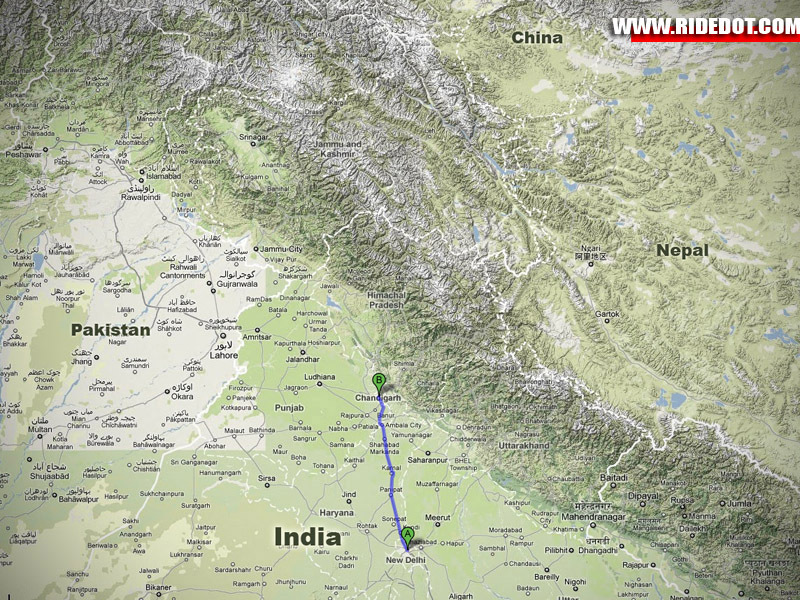 After a couple of minutes of prayer, the bikes and our journey are blessed! This was such a nice gesture of goodwill, I was very moved by his sincerity for our well-being! I don't know if Pinky ever wears a motorcycle helmet over his turban, but he could have used one while leading us out of Delhi. The rain was coming down in sheets and at times he had to take one hand off his scooter's handlebars to shield his eyes to see traffic. And at 8AM on a Sunday, there was still a lot of traffic. I don't want to know what rush hour looks like in Delhi! Without a GPS, we would never have gotten out of the city with it's labyrinthe of roads and roundabouts! Roadside stop where we were surrounded by beggars. See the dark clouds in the background? The Royal Enfields don't handle very well. With all the weight on the back of the motorcycles, the front end is very twitchy, especially at slow speeds and on acceleration. The brakes aren't very good either. 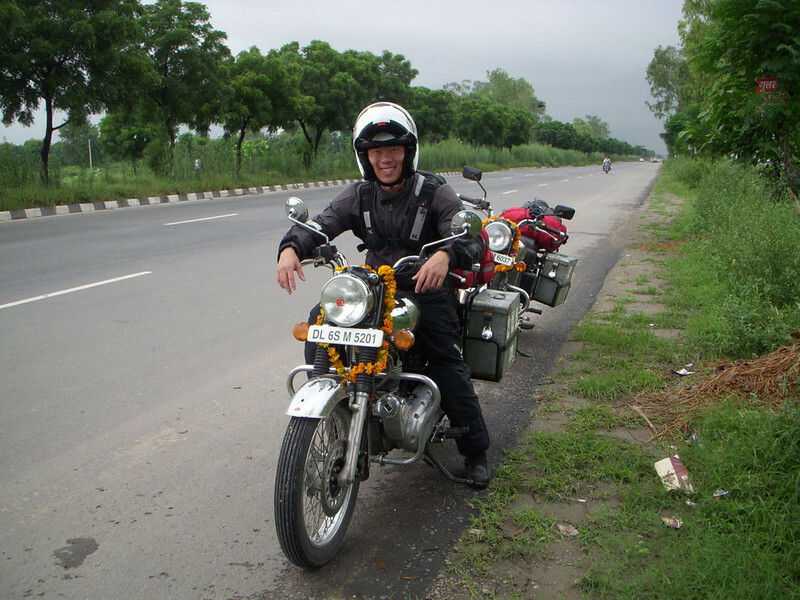 We nervously followed Pinky as his 50cc scooter blasted through large Delhi puddles that our 500cc fully laden Bullets thought hard about attempting. Traffic was insane! 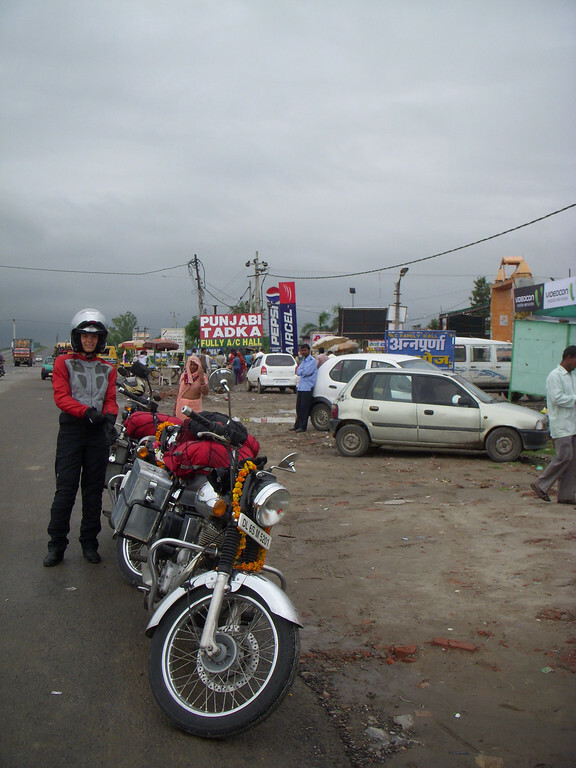 The rain would not let up, and did I mention they drive on the left-hand side in India? It was a lot to process that early in the morning...! "DriveClean" test to get a new pass. 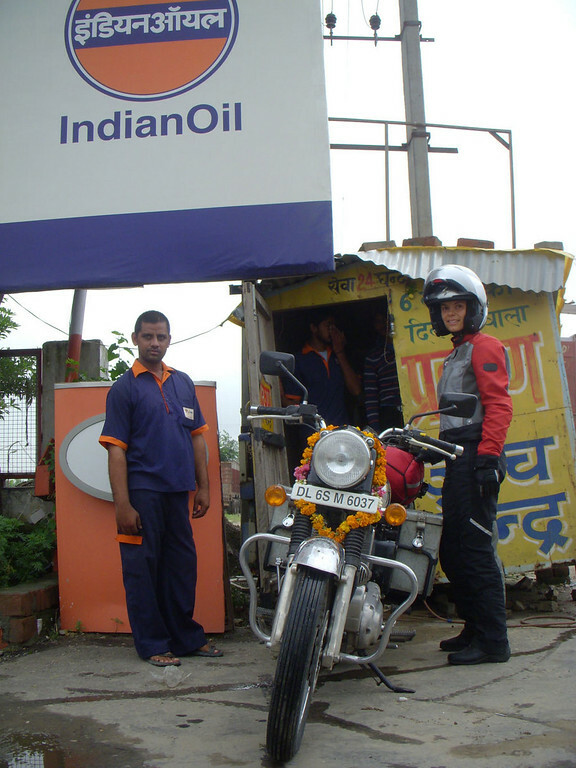 Indian Oil is like the PetroCan of India. After a harrying 45 minutes in Sunday morning traffic that would make the DVP at 5:00PM on a Friday look like an empty field, Pinky bade us farewell at the start of NH1 (National Highway 1) which heads directly north out of Delhi. Due to the weight and the gearing of our Enfields, we were suggested to only go 60 km/h, so as not to cause undue stress on the engine. Which was fine because most of the traffic was going that speed anyway. It was here along this stretch of road for the next few hours that Neda and I really got a feel for Indian traffic etiquette. The first revelation was the horn. We had totally misunderstood its purpose. Far from being the North American instrument to signal annoyance, the horn to the Indian motorist is the primary means of communicating whereabouts to other vehicles around them. It's a bit like bats using sonar. Indian drivers get a sense of what vehicles are around them by listening to the horns and where they come from. A little toot from your left? That means there's a scooter that's looking to squeeze in. A large airhorn from your right. A truck is passing and is telling you not to move over yet. If you don't use your horn, you are invisible. After a couple of hours of riding like this, I had a scary moment when the horn on my Enfield stopped working. It turned out to be a contact that needed to be tapped back into place, but for a few minutes I felt like I was riding in the dark with all my lights off! After an hour on the road, we pulled over at a roadside refreshment stand and were immediately surrounded by some young boys who were begging for spare Rupees. Apparently if you look like a foreigner, you are a source of free Rupees. Ugh, is this going to be like this everywhere? Another couple of hours and we were getting hungry. We've been worried about the food situation for quite a while. Our delicate Canadian gastrointestinal systems just aren't used to the food bugs around here. 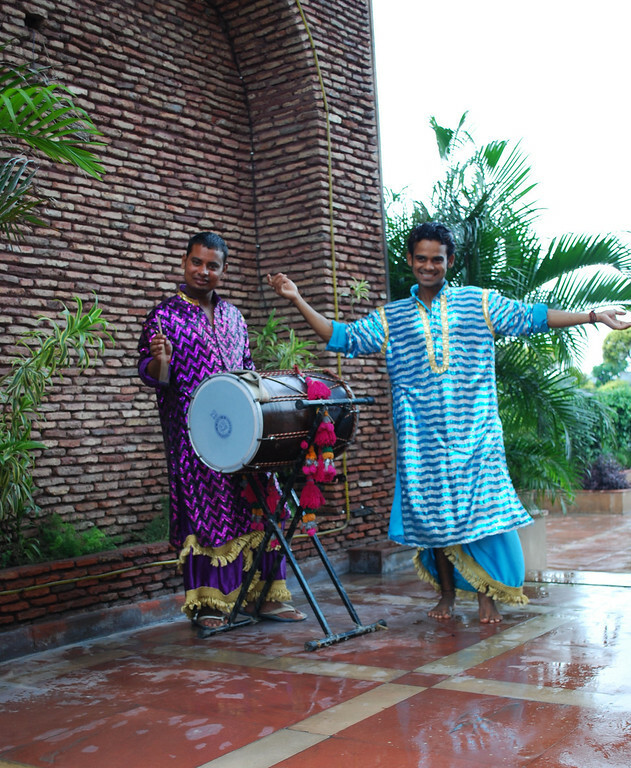 We don't want to get the dreaded "Delhi Belly"! We've tried to prep as much as we can, before we left we made sure we got our Hep A, B, C, D, and Z shots, got another shot for typhoid, pills for malaria, I feel like a Universal Soldier! I have to sneak this shot in. Every trip we've been to there's been a wedding somewhere. Anyway, we've been trying to eat at places where the food is thoroughly cooked, so we've had to bypass a lot of suspect places on the road until we came across a touristy area in the town of Karnal. 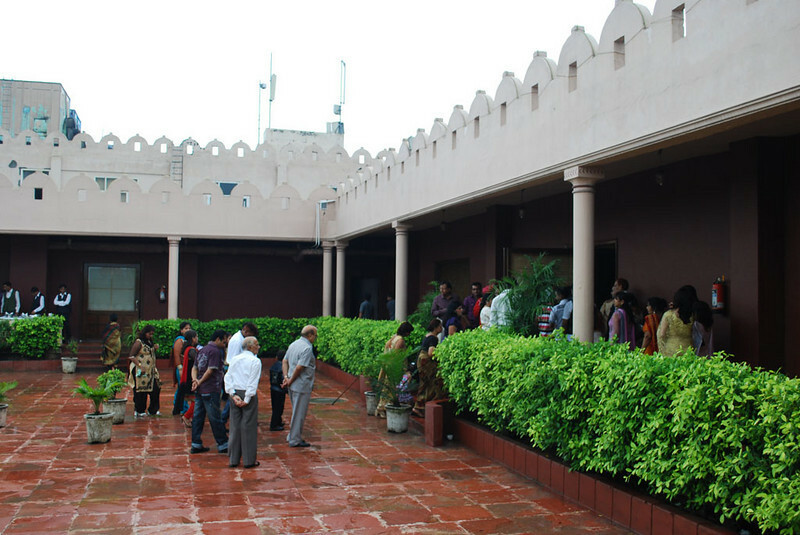 Karnal is half-way between Delhi and the next closest major city north of it, Chandigarh, and they take full advantage of it, setting up a nice hotel with shops and restaurants for the more well-heeled tourists. We like this spot not only because the restaurant serves well-prepared and cooked food, but because there is a security guard that watches all the vehicles in the parking lot, so we leave our dry bags bungied to the back of the bikes. We're trying to sample as much Indian cuisine as possible, but Neda's stomach can't seem to take the spices and she's having some mild digestion problems. 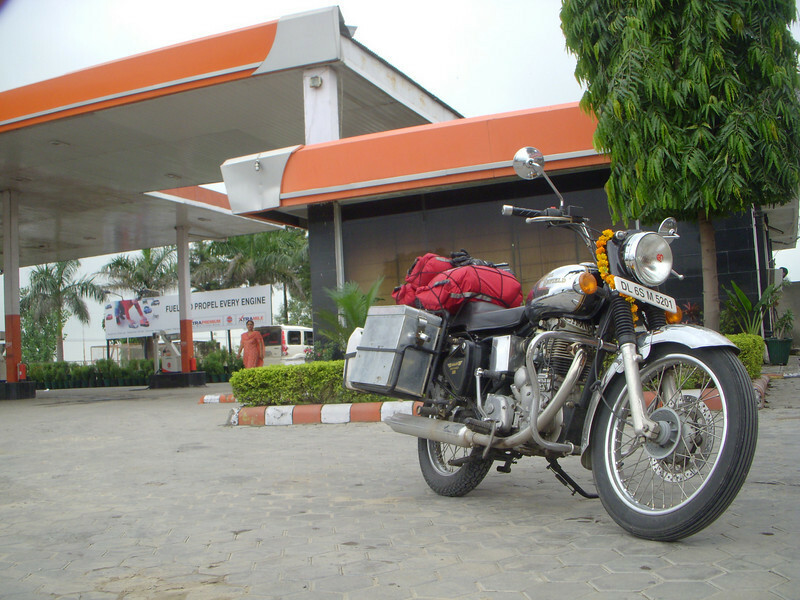 Back on the road, we make a habit of stopping at gas stations instead of roadside stands. Less beggars. 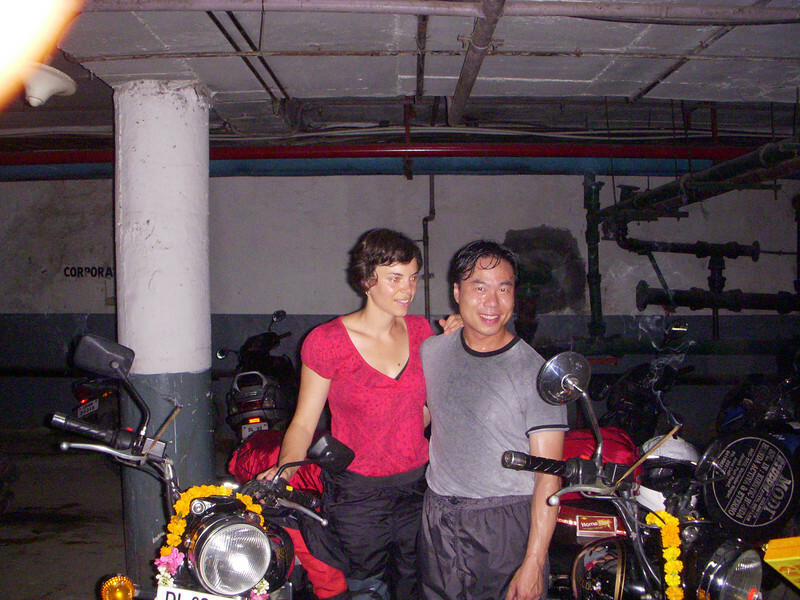 But every stop, our bikes and our foreign faces draw a lot of attention. It's very un-nerving having a group of men walk purposefully towards you and start acting friendly, wanting to know your name, where you are going, etc. But we realize very quickly that there is no menace in this and that it's the very straightforward (and friendly) nature of the locals. Normally we ask people to take pictures of us for us, we've had locals wanting to take pictures of us with them! I feel like such a celebrity! We're going to have to shake our suspicious natures on this trip - still not quite there yet though. The bikes are still wearing the garlands from the Puja! Chandigarh arrived 275 kms from when we left this morning. It took us almost 8 hours to cover that distance with the speed we were going and the many stops along the way. Checked into a hotel and Neda fell asleep almost instantly as I'm typing this out. We only got 3.5 hours of sleep last night and the focusing on traffic, rain and dealing with all the attention has sapped the both of us. Gonna get some rest now, long day ahead of us tomorrow!